John Cooper Robinson was an Anglican missionary who lived and worked in Japan in the late nineteenth and early twentieth century. The Cooper Robinson collection consisting of over 4,600 photographic prints, negatives, glass lantern slides, and postcards is one of the most valuable photographic records of this era. The exhibition on display at Rare Books and Special Collections was curated by Professor Allen Hockley and Naoko Kato. The exhibit highlights four major themes: Robinson and the Economies of Japanese Photography, Robinson and the M.S.C.C. Mission in Japan, Robinson and Japanese Religions, and Robinson’s Photographic Practices. 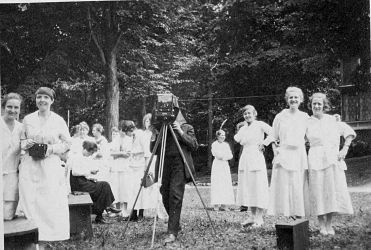 This exhibit features original photographs as well as glass lantern slides and glass negatives that were used by Robinson. The exhibit display at the Asian Center features a selection from “The Making of History and Artifacts (1888-1926): The Photographs of John Cooper Robinson from Meiji-Taisho Japan” exhibit, curated by Robert Bean with an introduction by Bill Sewell. Check out the John Cooper Robinson Collection Finding Aid to learn more about this extensive photo collection. 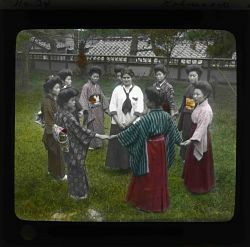 The Asian Library and Rare Books and Special Collections are delighted to host this new exhibit in conjunction with our March 24th symposium, Double Exposure | Japan-Canada: Missionary Photographs of Meiji-Taisho Japan. The exhibition is free and open to the public. For more information, please contact Japanese Language Librarian Naoko Kato at naoko.kato@ubc.ca.